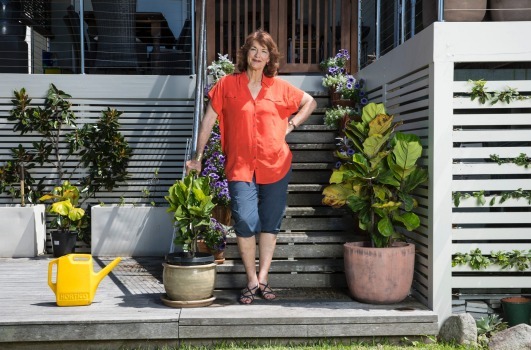 Renowned ABC journalist Geraldine Doogue is among the thousands of savers looking to capitalise on the latest changes to the superannuation rules and pump more money into their retirement pots. Doogue, the highly regarded host of Saturday Extra on the ABC’s Radio National, is considering plans to downsize the family home and inject some of the proceeds from the sale into her super account. While it is not a strategy that will suit all savers, primarily because of the potential impact on the age pension, financial adviser Nerida Cole expects that the number of superannuants who take this route will increase over time. In December the Parliament passed legislation allowing individuals aged 65 or over to sell the family home and contribute up to $300,000 to their super account. The injection can be made even if an individual has more than $1.6 million in super, a threshold that would normally prevent them from making further after-tax contributions. “I could see the logic of it as a piece of legislation. For me it would probably work. I thought I should take the opportunity of getting that concession,” says Doogue. The rule only comes into effect on July 1 and in any case Doogue is in no hurry. “I will meander towards it,” she says. The veteran broadcaster is thinking of selling her four-bedroom house on Sydney’s lower north shore towards the end of the year. Ideally she will swap it for a three-bedroom house with sufficient room for friends, children and grandchildren to stay. She wants to stay in the area, where she has built solid friendships over many years. Doogue is also aware of the need for caution at a stage in life when capital preservation is paramount and will look to sell her home before buying elsewhere. If possible, she wants to maximise the strategy and contribute $300,000 to super – but that could be out of her hands. “Who knows what the markets will do this year,” she tells AFR Weekend. The strategy is not for everyone, experts warn. The family home is exempt from means testing for the government pension. All other assets will be taken into account so savers need to be aware of the impact a sale of the home will have on their ability to access the age pension. A single home-owner can hold up to $552,000 in assets, before losing a part age pension entitlement, while a home-owning couple can hold up to $830,000 in assets before they lose a part government pension. Savers also need to be aware of the transaction costs associated with moving and realise that a smaller property, particularly a new apartment in the same area, may not be much cheaper. “The strategy will suit someone who already has in mind that they should sell their property and downsize. It reduces one of the barriers to making that decision. It makes it that little bit easier,” says Cole. Doogue, who has an interest in savings policy even if she tends to be more of a spender, fits that category. Under the rules a person, or at least one half of a couple, must have lived in the house for at least 10 years. The super contribution must be made within 90 days of the transfer of ownership of the house – although there is no requirement on the superannuant to purchase a replacement home. In theory, homeowners could sell and buy or rent a bigger home and roll up to $300,000 each into super. The money must be placed into an accumulation account and the individual will still be subject to the $1.6 million maximum that can be placed into a tax-free private pension. For a retiree who wants to draw a private pension, any super savings above $1.6 million must be left in a so-called accumulation account, where earnings are taxed at 15 per cent. Cole expects that over time, as fewer people will have access to the age pension because of changes to the means testing, more Australians will look to use the downsizing strategy as a means of topping up their super. The plan is that people aged 65-plus will be able to inject up to $300,000 from the sale of the family home into super. Downsizing a family home to something smaller and contributing any surplus amounts to superannuation is a strategy that has been around for decades. But for a range of reasons, it’s destined to grow in appeal. These reasons include the continuing buoyant state of the residential property market, especially in Sydney and Melbourne, where many retirees are finding it hard to believe just how valuable their homes have become. Aged 71 and retired with about $850,000 in super while his wife (66 and also retired) has a small super pension, they have recently downsized from their Sydney home and moved away to take advantage of the strong property market. The sale, which he says will be completed in January, will leave them with a surplus $500,000 in the bank after they have bought their replacement home. Can they start a new super fund for his wife with the sale proceeds and also top up his super, he asks. It’s a shame they are pursuing their downsizing strategy before July 1 next year, says superannuation lawyer Michael Hallinan, of Townsends Business and Corporate Lawyers. That’s because they are missing out on the new superannuation downsizer contribution entitlement that should apply from then. With legislation now passed, the government’s top-up contribution proposal is another reason why downsizing will grow as a future super strategy, he says. But because the reader and his wife are running ahead of the proposed changes, the opportunities they have to contribute to super are restricted. Once you have retired, and especially if you are over the age of 65, there is no scope to contribute to super unless you go back to work. If you return to work after 65 specifically to make super contributions, you must work in gainful employment for at least 40 hours over a 30-day period. Satisfying these conditions will create the opportunity to make an annual after-tax contribution of $100,000 from any sale proceeds. Retirees in Melbourne, says financial planner Matthew Scholten, are also taking advantage of high valuations on their homes to downsize and invest the balance. Many are saying they never thought their home values would be worth as much as they are. Necessity is another reason some are implementing a downsizing strategy, says Scholten. With retirees living longer, growing numbers are finding that as they get older, the superannuation that has been supporting them for 20 years since their 60s is running low now that they are in their 80s. In these circumstances, many don’t have any real choice, he says. To fund their ongoing retirement, they have to sell assets which include their family home. Scholten says he is assisting a client couple who have recently sold their family home in outer suburban Melbourne for $1.1 million, allowing them to buy a brand-new home unit off the plan for $700,000, leaving them with about $400,000 to add to their retirement coffers. The property does not settle for 12 months so they are renting and will invest the surplus money very cautiously until they have settled. They will also take advantage of a Centrelink entitlement to treat the proceeds that will be committed to their new home as being exempt from the asset test for 12 months. While the sums involved are not huge amounts, says Scholten, they will be very helpful for a couple close to 80 who have almost exhausted their retirement income assets. The surplus from the property sale will underpin their future retirement income needs. Again, they won’t be entitled to take advantage of the downsizer contribution proposal given this will only be available on the proceeds of any property sales from July 1. The downsizer contribution proposal will allow retirees over 65 who have sold a family home they have owned for more than a decade to contribute up to $300,000 as an after-tax or non-concessional superannuation contribution. Where a qualifying home is owned by a couple, up to $600,000 can be contributed to super under the downsizer entitlement. Another condition that will need to be satisfied is the proceeds from a sale having to be transferred within 90 days of the property’s disposal. The introduction of downsizing contributions into super is one of several measures announced in the 2017-18 Budget as part of the Government’s package of reforms to reduce pressure on housing affordability. The changes are being legislated because there are current contribution restrictions and caps that prevent older Australians from making super contributions. According to the legislation, being unable to invest some of the proceeds from selling their home into super discourages some older people from downsizing homes that no longer meet their needs. It means many larger family homes sit occupied by only singles or couples. Allowing downsizing contributions, it is claimed, will provide greater flexibility to contribute the proceeds into superannuation. One issue that is likely to arise from the downsizing contribution entitlement, however, is the potential Centrelink implications. Townsend’s Hallinan says the principal negative feature of the downsizer strategy is the contributions being transferred from a tax-exempt and Centrelink-exempt environment in the form of a family home to a possibly taxed and Centrelink-tested situation. So downsizer contributions are likely to appeal only to super members who are either excluded from the age pension due to the asset test or who have sufficient transfer balance space so that the contribution can reside in the tax-exempt side of their super fund. In short, downsizing contributions will mainly appeal to those who have non-super assets but not enough in super who are excluded from the age pension because of the asset test.